Last week it happened again: I returned from a service call without installing the newly rebuilt Thermostat I had deemed necessary for a malfunctioning oven. Great for the customer, but I was left holding the bill for a rebuilt T-Stat that was all dressed up with nowhere to go. That's twice in the last 6 months. Time to pass on some hard earned wisdom: the next time your oven won't light, or is difficult to light with burner flames that don't get very high resulting in a 24 hour slow cooker rather than an oven, don't jump to the conclusion that your 60 year old Thermostat's gotta go. To keep things simple and understandable for the qualified gas appliance repair professional you have engaged to fix your oven, I will lay out the basics of the problems I encountered above. One stove had been in storage for a year or more. When the owners hooked it up, they immediately realized their oven had a problem. The other oven had been in everyday use when it "suddenly" stopped working. One stove had a Constant Pilot Safety System: it's pilot light was doing fine, and its oven burner would light, but the flames were very small. The temporary pilot in the oven without the Safety System would light, but not the burner: there was absolutely no gas going to the burner. The common symptom: both had difficulty passing gas. This is actually good news: the signal that something other than the Thermostat may be at fault. The very first thing to do with this symptom is to isolate where in the system gas is being restricted, and the very first place to check is the Thermostat. Why the Thermostat? Since there are many places in the system where obstructions can occur (between the supply pipe entering your kitchen and the gas jet entering the oven burner), the highest-priced component in that pathway is the Thermostat. So have your repair person isolate and test that first. If human breath can be made to flow freely through the completely disconnected Thermostat, then the restriction lies elsewhere: in the pathways supplying or exiting the device. In my client's stove that had been stored before use, insects had somehow entered the system and completely clogged the aluminum tube immediately before the oven burner gas jet (the oven pilot, running on its own small-diameter gas line from the Thermostat, was not affected). After determining the cause of the problem, I cleared the line with a pipe cleaner). In the other client's stove, the clog was at the tip of the gas jet itself, an accumulation of mineral deposits: it was cleared by simply loosening the cap and using a toothbrush to clean the tip. In my experience, a malfunctioning Thermostat is most often characterized by an oven that easily lights but who's heat is high and uncontrollable by the Thermostat dial. If your oven won't light easily or won't light at all and has very low temperatures, look to obstructions that are restricting the gas supplying or exiting the Thermostat. Having serviced quite a few Chambers "In-A-Counter" cooktops recently, I've come to appreciate their unique characteristics, compared to their free-standing sisters. Typical Chambers design and build quality, together with distinct features, makes it clear why Chambers cook top units were so incredibly popular from their introduction in the 1950's until the company's demise in 1987. Anyone considering a cooking appliance should take a close look at the "In-A-Counter" cooktops. (For clarity, this post is discussing full size cooktops, rather than non-griddle units like these). Our family shares ownership of a farm near Dodgeville, Wisconsin. The farm is in what's called the "driftless" region of Wisconsin, a very hilly area that the last few glaciers didn't plow through and render flat, like most of my Illinois homeland. Us flatlanders are easily impressed, and particularly enamored with this part of Wisconsin: the contour plowing, classic farm buildings, and winding blacktops provide a beautiful quilt of color and textures. The farm's former owners nurtured Sugar Maples and apple trees near the farmhouse, and we strive to keep up their tradition of bringing in the harvest. 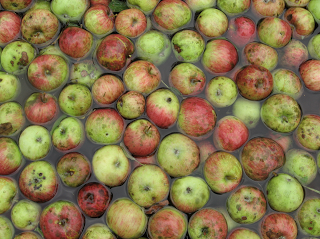 So this recent weekend we and our farm partners spent our post Labor Day "vacation" as we often do: working like dogs processing our crop of apples into cider. This year's crop was particularly abundant, and fortunately, our farm partner's son brought three of his college buddies along to share in the harvest work. The farmhouse has a horrible electric range, which we all hate, and in the remodel of the kitchen that we've been dreaming about for years we've of course known that it will include a Chambers range. However, while feeding the Apple Cider Gang of ten, with the In-A-Counter cooktops on my mind, it became clear to me that the Chambers range just won't do: it will have to be a Chambers cooktop and wall oven. Besides not having an oven, the basic difference between "In-A-Counter" cooktops and stoves is that cooktops do not have a ThermoWell. Some Chambers purists argue that the lack of such makes a cooktop less than a "real" Chambers. Everyone's entitled to their opinions: I absolutely prefer the aesthetics of Chambers stoves, and love the unique fact and function of a ThermoWell. To my eye, cooktops come across as visually cold, even stern, compared to their more colorful and curvy companions. But two nifty things I'm admiring about the cooktops are its four surface burners, and the extra space around each of them. As the one doing most of the cooking back home in Chicago, it is annoying how the crowded burners on our Chambers Model B range will not allow large pots and pans to all sit centered on their burners. It's not due to the range's small size. Ask anyone who's had to accommodate their existing cabinetry to a Chambers range: 37" side to side, compared to the standard 30". It's the placement of the Griddle/Broiler on the left of the range resulting in the burners on the right being crowded quite close together, so much so that large skillets and pots will not be centered on their burners. The In-A-Counter units still have the standard countertop depth as ranges, and gain only 1/2" of extra space between the back burners and the backsplash. Not much, but it is an improvement. The big difference is the increased width, devouring even more prime countertop real estate than a range: a massive forty two inches! That extra width, and placement of the Griddle/Broiler at the center of the cooktop, between the left and right banks of surface burners, results in much easier placement of large pots and pans on a busy surface. I love the look of our white Chambers B, and whose heart doesn't skip a beat at the sight of a gorgeous red hiback Model C? But when push comes to shove, when ya gotta feed alot o' pancakes, eggs and bacon to alot o' hungry people, you want to do it easy and fast. Give me that spacious In-A-Counter cooktop! 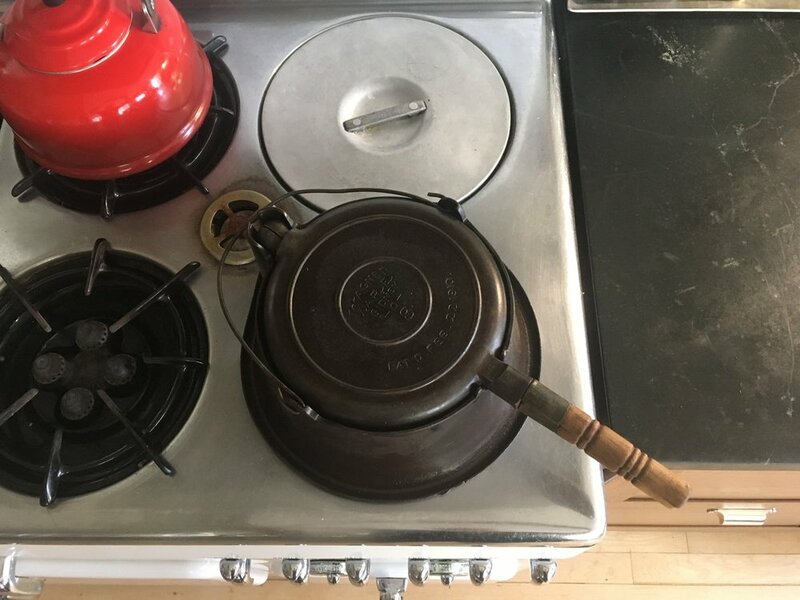 One issue with the majority of Cooktops is their bad "idling" habits, requiring two to three pilot lights: one for the left bank of burners, one for the right burners and griddle, and a third if the unit has a "Burner with a Brain." If you want to prevent this amount of heat from escaping into your kitchen and melting the polar ice caps, you can do one of two things: turn off the pilots and use a hand-held grill starter to ignite the burners, (Click here to check out that post), or seek out the last In-A-Cooktop versions that utilized electronic ignition. Very nifty, very simple and robust. As an ardent Model B fan from day one, I'm certain to have guilt pangs when looking at that cold, soul-less, stainless steel In-A-Counter cooktop some future morning after we've remodeled the farm's kitchen. But while enjoying it's extra capacity and conveniences cooking up the huge breakfasts and dinners required to feed our workers, er, guests, at harvest time, I know those pangs will be forgotten. And who says that the new addition can't accommodate both a cooktop AND a stand alone stove?? ?